Not bad for a lazy Sunday afternoon’s work. We have installed everything I have assembled. 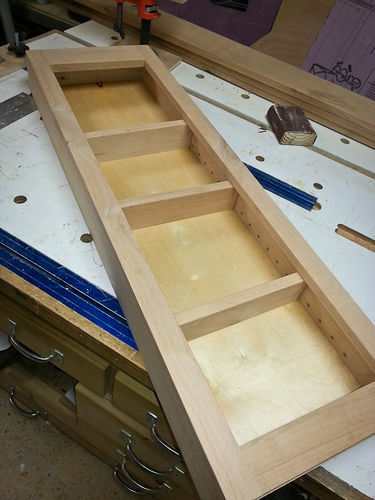 I will have to make a 1/8th – 3/16 inch filler strip to fit where the cabinet clamps are. 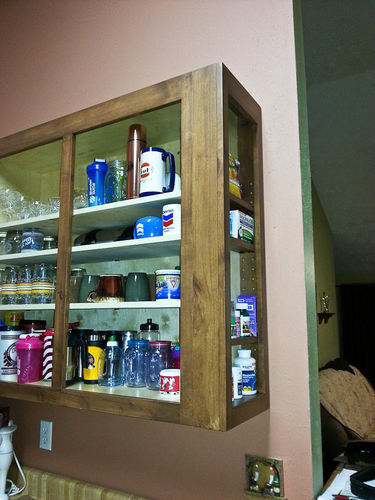 I held off building the cabinet for above the refrigerator. 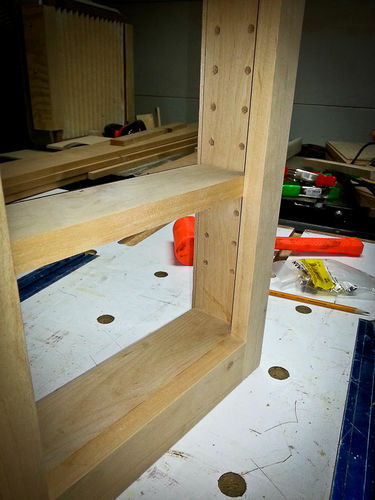 I need some good measurements…and probably a thin filler strip also. Dang crooked walls. Getting old and having bad knees can make this work unpleasant at times. Fortunately, my helper still has plenty of get up and go! 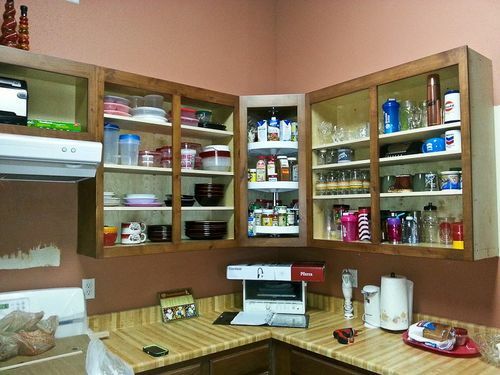 Plus it’s her kitchen afterall! 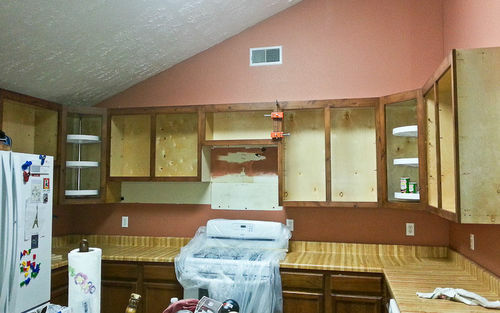 These pics brings this project up to date. 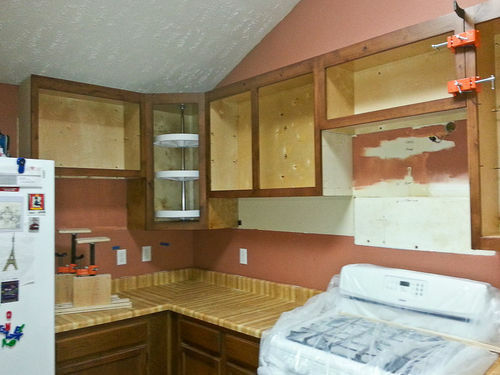 Next week I will start on the base cabinets. More pics to come in the near future. 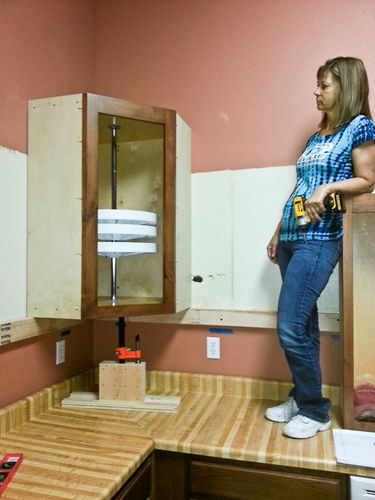 Did I mention how much I like those cabinet jacks? They work great! First things first. Gottat get the Tony Chachere’s Seasoning in the cabinet first! Gratification and motivation, all in a days work. Coming together quite nicely, Mike. Thank you. The shelves are being reloaded. Doesn’t look like anything has been accomplished, but it has. 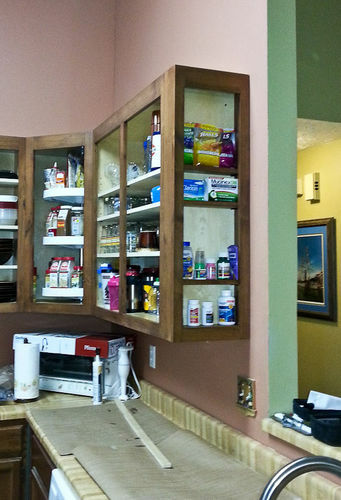 I had to trim the edge banding on all of the shelves. My wife was busy emptying the boxes and putting everything in place. 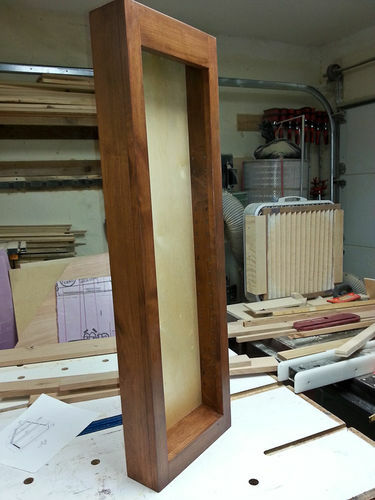 I made the 7/64th’s filler strip and got it stained. 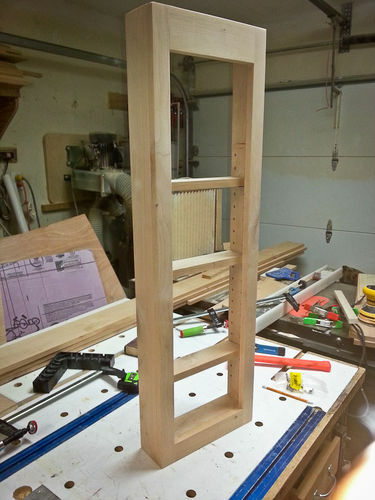 Hopefully, I can get some finish on it and install it tomorrow. 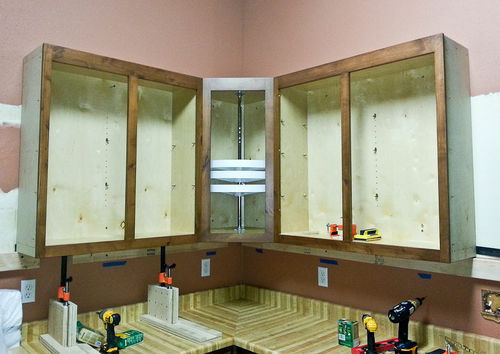 I spent some time today building a slender cabinet that fits at the end of the upper cabinets on the right side. My wife had seen one at the big box store and took pictures of it. I had included that in the original layout so there was room. 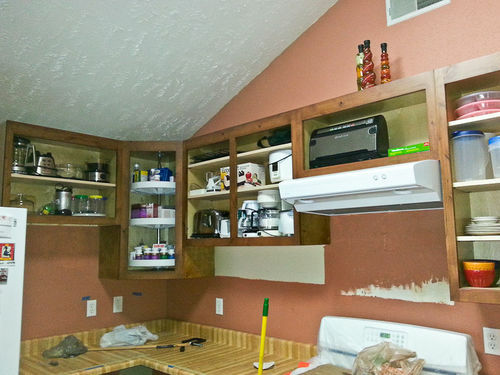 Basically, this cabinet looks like the end of the other cabinets with a decorative end panel. 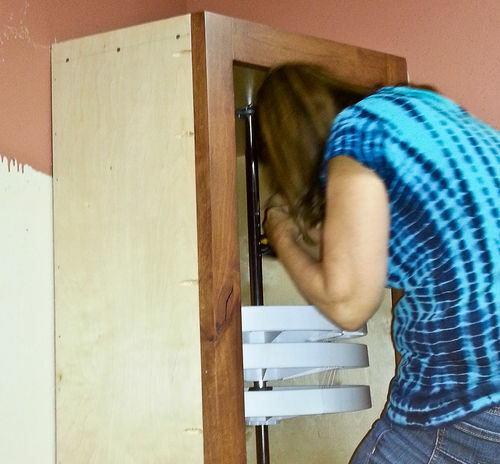 But the panel will be hinged. 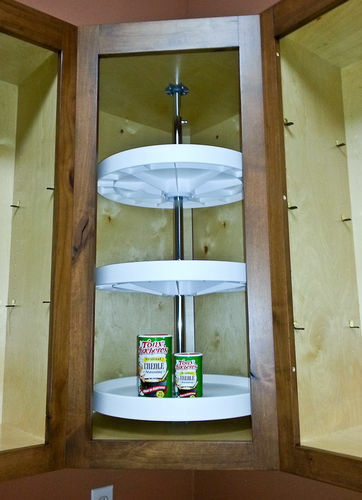 When opened, it will revel a shallow storage area for keys, pill bottles or whatever you can put in there. It is only 3 1/2 inches deep. 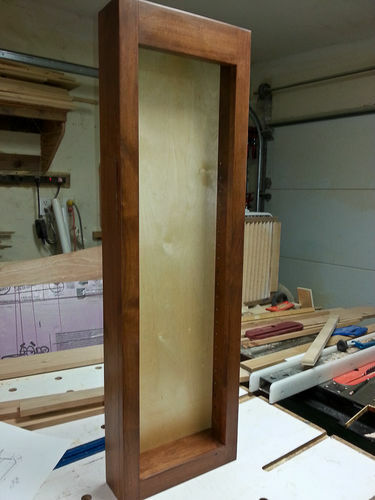 As soon as she gets the cabinet stained, I will spray the finish, install the back, and attach it to the other cabinet. Looks like we will be ordering doors this coming Friday. The upper doors have been ordered. 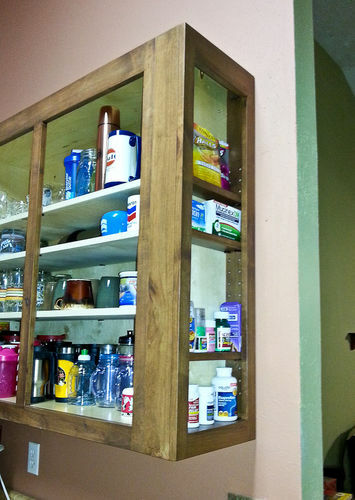 And I finished the medicine cabinet/key locker and got it mounted in it’s place. Looks nice from my point of view. That is lookin so good. Thanks. Things are coming along nicely.